So it's not going to be the classic changing of the guard match that many thought it might be, with the GOAT not making it through the semi final to face the old GOAT for one last match, instead it's still very much an old versus new game, as Phil Taylor, winner of a squillion major titles, faces up against Rob Cross, a professional for less than a year in just his second major final. In what must be a first, this will be the first time the two players have faced off against each other in any competition, somewhat understandable as Taylor's played none of the tour this year and Cross has played none of the tour prior to that, but still an amazing stat regardless. 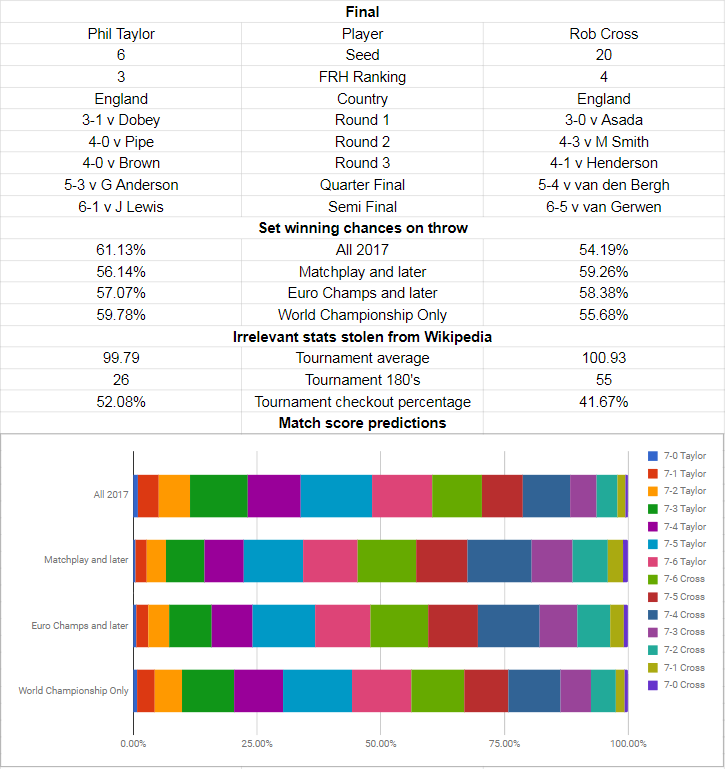 Their stats so far in this tournament are rather similar - Cross has won five more legs, slotting in 18 twelve dart legs to Taylor's 16, Taylor has an extra five visit leg won leading 40-39, while Cross leads the six visit leg won count 21-18, leaving just three legs between them in more than six visits, Cross bagging two to Phil's one. Cross has lost a lot more legs with several of his games going the distance, losing 72 legs at an average of 95.15, whereas Phil's lost just 43 at a slightly lower average of 94.06. So overall on this tournament, very little to separate them. If you look at the season long stats, there's not a huge amount of variation - recall from previous writeups that Phil has zero legs from before the Matchplay, so his figures for the first two stat rows will be identical and the variation is just down to Cross, and you can see that Cross does a bit better in the more recent stat range, which you'd kind of expect, as it wasn't until a few months into the circuit that Cross really exploded in form. Take out the period from the Matchplay to the European Championship and Phil does ever so slightly better on the numbers, perhaps surprising given you're removing a tournament that Taylor won, but then look at just this tournament and you get the best sample for Phil outside of the full data set. I've calculated the match score figures on a set by set basis for one reason only - it's Taylor, and he's been doing that thing again where he gives away the darts even if he wins them, so I can safely project Rob throwing first (Rob winning the bull and giving Taylor the darts would be great stuff), so the match scores will naturally lean towards Cross taking an even number of sets in the cases Phil wins, and Phil taking an odd number of sets when Cross wins. If that doesn't make sense, think about what Taylor needs to do to win exactly 7-1, 7-3 or 7-5 - he needs to close the match out in a set where Cross has the darts. You can see in the graphic that the median score in every data set is a game that goes the distance - this threatens to be an extremely tight game, and the market reflects that with Phil being a generally available 10/11 and Cross a generally available evens, very slightly longer on some obscure books. As such, I'm not placing any bets on this as it's way too tight to call. If you are wanting to bet, it's a case of how much you think Phil's experience will count for - he's played a trillion finals, been there, done everything, but it also is a question of how you think Phil will react when tested, as you feel he surely will be here. Lewis might have asked a few questions if he'd pinned some key doubles, Anderson's score was close but the game wasn't as close as the scoreline suggested, whereas Cross has been taken to deciders three times and survived match darts in two of those games, so he will not be concerned if the game becomes close. If Cross is able to hold his throw in the initial sets and get a break, perhaps to lead 4-1, then it asks big questions of Taylor and becomes a question of whether he can answer them. Edit 1/1/18 morning - have updated the graph on the data sheet, while my explanations indicate that Cross is likely having the darts first, the calculations were made based on Taylor having it, whoops. This is now corrected (was only throwing some of the more probable scores off by a percent or so), but still, you're not actually placing bets on silly markets like correct scores, are you?